Gerald is only three years old when his mama leaves him alone in the house while she visits her drug dealer. He finds the hot thing she uses to light her cigarettes and in no time, the house is ablaze. Mama is sent to prison, and Gerald goes to live with his Aunt Queen. When he turns nine, Gerald unhappily learns that his mama is being released from jail and wants her son back. Suddenly, he must switch from a loving home to a household dominated by his abusive stepfather. When Gerald learns a terrible secret about his stepfather and the half-sister he has grown to love, he'll have to find the courage to do what's right. 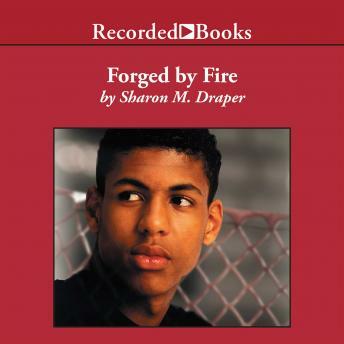 Author Sharon M. Draper, a National Teacher of the Year Award winner, tackles tough issues like physical and sexual child abuse. Thomas Penny's empathetic narration makes Forged by Fire and unforgettable listening experience.